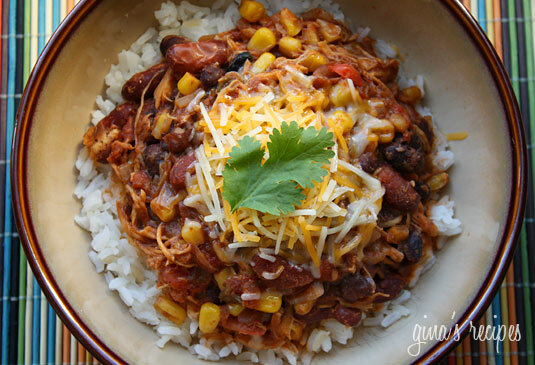 This crock pot chicken taco chili is one of my most popular recipes! Easy prep, just dump it all in! Freezes well and the kids love it! Chicken Taco Chili is one of my favorite chili recipes! It’s so good served in a bowl with multi-grain chips, topped with reduced fat cheddar cheese or avocados. This makes a lot and it is even better the next day for lunch. If you prefer the pressure cooker, you may enjoy my Instant Pot Chicken Taco Chili version instead. A great freezer-friendly meal! Allow chili to come to room temperature and store in an airtight container for up to 4 days in the refrigerator or up to 3 months in the freezer. Easy for leftovers – try these Chicken Taco Chili Stuffed Peppers! 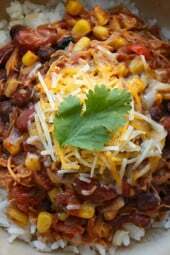 This crock pot chicken taco chili is one of my most popular recipes! The perfect slow cooker dish because you just dump all the ingredients in, turn it on and come back to the best tasting meal! No prep, super easy, freezes well and the kids love it!